How many times a week do you utter the phrase “Boy I need a vacation”? I went to Florida for 10 days in March. I spent the last 4 days of that trip being sicker than sick. At work I have been going non-stop on some major projects with extremely tight deadlines. So yeah, I probably exclaim daily that I need a vacation. Also, I live with anxiety disorder. The great thing about anxiety is that it does not need to be triggered by anything. It can just appear because. As in for no reason at all. Stress can definitely exasperate it. But it is not a necessary catalyst. A trusted adviser (i.e. therapist) reminded me that if I don’t practice taking care of myself every day then it would be that much harder to deal with the anxiety monster when it rears its ugly head. She suggested taking daily 15 minute vacations. A 15 minute vacation is basically when you shut out the thoughts and practice mindfulness for that short “vacay”. The first night I tried to do one of these 15 minute vacations, I went into my bedroom equipped with my iPod and was ready to do this. I shut off the light, laid down on my bed, and searched for my guided imagery meditation podcast. After a few minutes of searching with no results, I remembered that I had deleted all my podcasts. So I lay there thinking that I would turn it into an awareness of breath mindfulness exercise. But my mind kept wandering. I tried to bring it back to the present, but it was not that easy. So to make things a little easier for myself I went and bought those adhesive glow in the dark stars and stuck them on my ceiling. Now when I go in there and turn off the lights, suddenly I am stargazing. It makes those 15 minutes go by very quickly. Another thing I do is very relaxing. A while ago Todd bought me a little massaging foot bath. I fill it up and take it into my special room (another blog post about this room at a future date), turn off the lights, turn on some music and turn on the bath, And it is blissful. It is 15 minutes of melting into the seat and releasing tension. Whether you suffer from anxiety or not, chances are you deal with stress. We all do. We live in a crazy, fast-paced, instant gratification type of world where it is impossible to avoid stress. For that reason, I think everyone should practice taking care of themselves every day. How would you spend your 15 minute daily vacation? I don’t get it. I want to get it. I have tried to get it. But I don’t get it. As the weather has turned warmer, all you Clevelanders are posting about drinks on patios. There are blog posts devoted to which patios are the best. Similarly there are blog posts espousing the virtues of many an exotic cocktail. This conversation topic was especially rampant this past holiday weekend. I want to be like you. I want to tell you about the delicious new “summer sipper” that I discovered. Or about the fabulous four hours I spent at the city’s hottest outdoor watering hole. But I can’t. And probably never will. For starters, I don’t really drink. This is not a religious or moral decision. I simply don’t like how most alcohol tastes. Except for the frou frou drinks. And even those, I don’t want to be able to taste the alcohol. Also, cocktails are not cheap. Now that I’m a respectable married lady, the only man buying me drinks is my husband. And the money he uses to pay for those drinks comes from community funds. So yeah, there’s that. Second, did you guys know that it was over 90 degrees outside this past Memorial Day? Also, have you heard of this little invention called air conditioning? It’s super cool. You turn a dial on a little widget on the wall, wait a little bit, and your whole house cools off. See, I am always hot. Like always. Like when the other girls at work have their little space heaters on, I have my desk fan blasting me in the face. Always. Hot. So, sitting on a patio, in 90+ degree heat doesn’t necessarily appeal to me. Hot, sweaty, sticky sipping on an expensive not great-tasting adult beverage does not a great day make. Not to this girl anyway. I want to be cosmopolitan and cool like the rest of you. But I will settle for actually being cool in my air-conditioned house, sipping on an alcoholo-free arnold palmer. Hi! 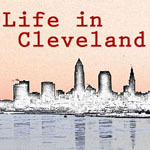 I’m Jeanne (aka Sourire11) and I blog over at Life in Cleveland. Today we are doing a posting swap through the Ohio Blogging Association and the topic we decide on was to blog about… blogging. I started blogging waaaaay back in 2005. Back then as a knitter one of the best way to find out how a pattern would work out was to check the knitting blogs. It seemed wrong that I wasn’t contributing to that online knowledge bank. So I started a blog as a way to post my projects for others to learn from. And then I got into it. Really into it. I loved sharing our adventures and our life and so much more than just my knitting projects. And I enjoyed trying to write and photograph at a quality that other people would be interested in. I also found that I loved reading other people’s stories. Seeing their lives – not just their knitting. And I learned that everyone’s story is interesting. My life has changed alot since 2005. Now we have two kids so my story is much more focused on them. I very much enjoy looking back through my blog and seeing how they have changed. And how we have coped with each stage of our life (hint: it usually involves wine). I often feel that my blog is a misfit. cover more than one category. But that pretty much sums up my life right about now so it works. Community. I love all of the wonderful people that I have me through the online world. It’s amazing how supportive and interesting and awesome the internet community can be. I have made some fantastic friends through blogging and am excited to be a part of this swap. It’s so fun to find a new blog to read and a new story to follow! Anyways thanks so much to Lilia for having me and to the Ohio Blogging Association for organizing this swap!! !